Plenty busy with fishing, golfing and grandchildren, Jim Slaughter, a Duke retiree, doesn’t just volunteer because he has the time; he volunteers because, as they say, he has the heart. Diagnosed the day after Christmas 2013 with stage 4 small bowel cancer, Slaughter knows first-hand the challenges, both physical and emotional, associated with oncology care. He said his care team — oncologist John Strickler, MD; surgeon Sabino Zani, MD; and physician assistant Evan Dropkin — “pretty much pulled off a miracle.” This life-changing experience drove Slaughter, a long-time Duke employee, to consider doing something more. “When cancer got my attention, I figured that 42 years of service was enough,” recalled Slaughter. His career had included managing housekeeping, directing the student labor pool, and overseeing the Bryan University Center facilities and Special Event Services. A jack of all trades, Slaughter had handled logistics for two presidential visits, an untold number of football and basketball games, and rock acts like the Grateful Dead (four times), Joni Mitchell, and Earth, Wind & Fire. No one would have blamed him for just wanting to wind down after decades working what he fondly described as a “circus job where never a mundane day went by.” Not to mention a challenging battle with cancer. But in February 2015, as soon as his scans were clear, he returned to work at Duke — this time as a volunteer at Duke Cancer Center. 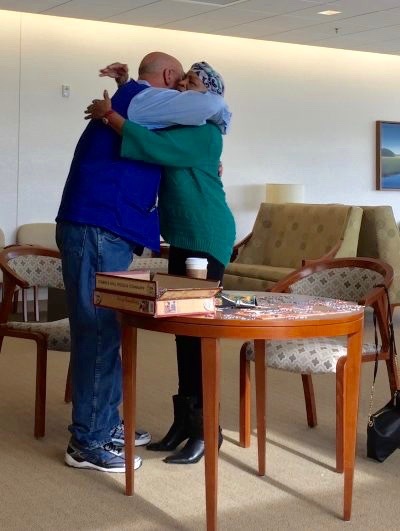 Slaughter, 68, is no stranger to the oncology treatment floor, where he spends four hours a week greeting patients with hot cocoa, warm blankets and often, a hug. He lets everyone he meets know that he’s also a patient. He said it helps him communicate better with patients when they know that he knows what it’s like. He checks up on them and they check up on him, like when his doctor discovered then treated him for a cancerous lymph node a few months after he started volunteering. “We probably get more out of this than the patients, isn’t that right,” quipped Slaughter, grabbing a coffee with a fellow volunteer. Not even an icy storm early last year could keep Slaughter away from the place where everybody seems to know his name. He got into his four-wheel-drive and reported for duty. Recently Slaughter had a PET scan following some abnormal bloodwork.